In the last week or so, I have found a number of prompts to encourage me to think more about web logs (blogs) as scholarly products. Darrell Cobner’s use of Medium to share his thoughts about educational technology is my starting point. I think he has chosen a great platform to stimulate discussion. I like the idea that Medium helps support the opportunities to share ideas, particularly in a collaborative way. Darrel has started this process for performance analysts. This latest debate stemmed from @janremm tweeting newly published guidelines from the Modern Language Association on how to cite a tweet. This organisation wasn’t the first to define its Twitter citation standards and there is not yet one universally accepted method, but the fact that academics are citing tweets at all says something about publishing and the public sphere. it makes sense to create a Twitter-only journal, which would publish original, peer-reviewed research, direct to the reader. 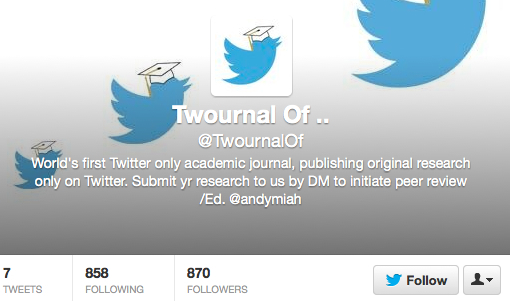 And that is what I have done: introducing the world’s first Twitter journal of academic research, aka @TwournalOf. Part philosophical provocation, part genuine intervention, I want to explore the willingness of researchers to share their original findings in a new format. This makes a very attractive companion to Medium which enables comments through a Twitter account. As I was thinking about @TwournalOf I was reminded of Lol My Thesis. 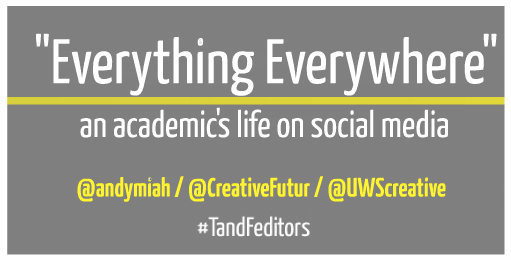 These twitter chats and even blog posts are not the deep discussions needed for us to make all the right decisions in education, or even our personal lives. They are however starting points. They are flags, signposts, billboards, and bulletin boards to concerns that educators have. They are forerunners and precursors to the needed deeper discussions. I see them as opportunities to explore and develop voice. I do think we can have scholarly discussions through them. They are products for me in the context of my epistemology and ontology. I was interested to learn that such activity may pose a threat to the International Studies Association. Carl Straumsheim writes “The political science blogosphere has erupted in protest after the International Studies Association unveiled a proposal to bar members affiliated with its scholarly journal from doing just that — blogging”. I share John Sides’ view that “I don’t think that the discourse that occurs on blogs is necessarily any more problematic or more unprofessional that the discourses that editors are going to have in other contexts in their own scholarship”. I liked Stephen Downes’s comment on Carl’s post … “These days, many of the blogs I read are more scholarly than many of the journal articles I read”. the new breed of open-access journals that are free for anybody to read, and have no expensive subscriptions to promote. Born on the web, they can accept all papers that meet quality standards, with no artificial caps. Many are edited by working scientists, who can assess the worth of papers without regard for citations. As I know from my editorship of eLife, an open access journal funded by the Wellcome Trust, the Howard Hughes Medical Institute and the Max Planck Society, they are publishing world-class science every week. The shared purpose of ds106 is what many consider to be an important, perhaps the most important, shared purpose of all who contribute to the web – to share things we find interesting or create things that other people find interesting. 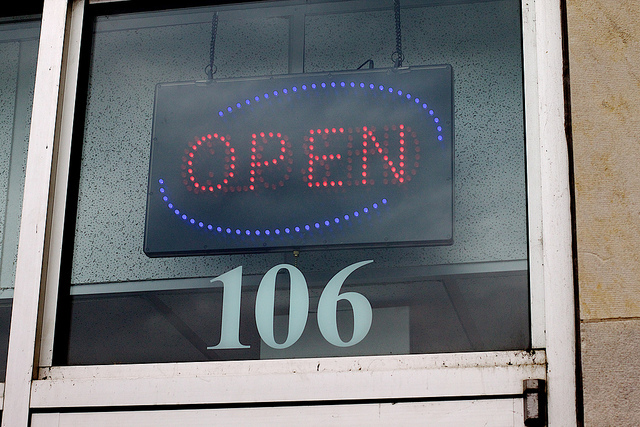 The heart of ds106 is to create, share, and comment on interesting media objects. In ds106 and in the courses I’ve convened online, the glue that holds together the students, the texts, and the discussions is the enthusiastic sharing of individual learning – instead of absorbing and sequestering the knowledge one gains from participation, each participant becomes a kind of instructor to others, including the instructors. I do think web logs are a primary vehicle for this activity. I am using ‘web log’ to underscore that our participation is recorded and can be accessed openly. As Darrell has indicated in his Medium post, it is a log of our collaborative engagement too. I see this a considered scholarly undertaking with a self-conscious appreciation of what is to count as evidence and what is to count as argument. 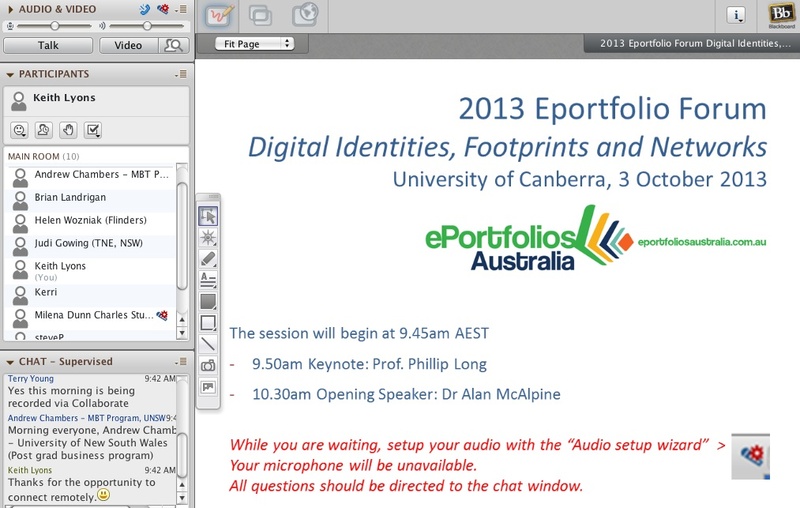 I missed attending in person this week’s ePortfolio Forum at the University of Canberra. I was able to participate virtually in the Forum through Blackboard Collaborate and the #eportforum activity on Twitter. Angela Shetler has created a Storify link for the event too. I felt very fortunate to be able to connect this way … and to find some new colleagues to follow on Twitter. I thought it was a rich vein in a serendipity economy of social capital. Particularly when there are so many other connected educator events taking place this month (Ronnie Burt has an Edubloggers’ Guide to the month). My reading in the past two days has had strong connection themes. Once an educator connects with other educators, they begin to collect them as sources in a Professional Learning Network of educators, a PLN. A connected educator may then access any or all of these sources for the purpose of communication, collaboration, or creation. This connectedness is not bound by bricks and mortar. It is not bound by city limits or state lines. It is not limited by countries borders. The only nagging inconvenience is dealing with time zones on a global level. My connections are focussed by connectivism. I was delighted to discover that Stephen Downes had written a Half Hour post yesterday that explored the epistemological and ontological foundations of connectivism. I noticed too that one of my colleagues in CCK08, Cristina Costa, has written this week about the participatory web and digital scholarship. One of the main findings from Cristina’s study was that “research participants clearly felt the benefits of practising digital scholarship, and it has influenced their entire approach to scholarly practice”. One of the aspects of this practice I am always trying to resolve is auto-sharing. I was delighted to read Mary Hiers’ post today. In it she discusses five auto-share options: dlvr.it; Buffer; Viraltag; SocialOomph; GaggleAMP. One connected educator who impressed me immensely this week was Andy Miah. Both presentations are wonderful examples of the digital scholarship discussed by Cristina. They contribute to a key theme of this Connected Educator month about “how to move from merely connecting with other educators into collaborations that push pedagogy and the education conversation forward”.